I have to admit that I’ve been in a creative rut lately. It happens to me quite a bit, but I have learned one thing…go back to simple. It works for me every time. So, that’s what I did. To help with a little inspiration, I checked one of my favorite sketch sites, CAS(E) This Sketch. I love their sketches because they are generally simple, but allow for a lot of creativity. For my card, I started with a stamp set from Lil’ Inker Designs that’s been out for a while…Filled Heart. It’s such a beautiful stamp set, and the design practically makes your card for you. I gold heat embossed the heart image onto watercolor paper. The light coloring is from my Light Violet Zig Clean Color Real Brush marker applied with my water brush. It is very subtle, but adds just the perfect softness to the image. The greeting from the same set is gold heat embossed onto a strip of watercolor paper. I cut fish tail ends on both sides and attached it with foam tape to give it some dimension. All that was left was matting the card front. I decided on a piece of Recollections gold glitter card stock. This was the first time that I have used this paper, AND I ABSOLUTELY LOVE IT!!! It has a nice heavy weight (and it comes in silver, too)!! The photo doesn’t really do it justice. It sparkles beautifully. After attaching the card front to a white, top folding A2 card base, I added a few gold and iridescent sequins to finish it off. Unfortunately, the photo makes the gold sequins look brown. Trust me, they are a beautiful, shiny gold. I hope you like it. I’m thinking of adding it to my Etsy Shop. Let me start off by saying that I absolutely love all of the large floral background stamps out there. I really do. I am in awe of the beautiful cards that card makers create with these large stamps. That said, I’m also a little bit nervous to try and make a card using them myself. I started off by stamping the stamp onto Bristol paper with Versamark ink. I heat embossed it with Zing Silver Metallic embossing powder. For coloring, I decided to use some Zig Clean Color Brush Markers—Deep Violet for the flowers, Olive Green for the leaves and Light Blue for the empty spaces. I have to say that I’m still learning how to use these markers. It’s definitely going to take some more practice until I’m completely happy with my results. For my greeting, I cut a strip of velum and chose some sentiments from Technique Tuesday’s Fringed Dahlia stamp set. I heat embossed it with the same silver embossing powder. I trimmed the floral piece down to allow for some matting. I adhered the velum strip to the floral piece by attaching it on the back side. Using fun foam for dimension, I attached the floral piece to a piece of white card stock. For the final mat, I used a piece of Swiss Dot card stock in a light purple. All of this was attached to a white, top folding card base. Once it was all put together, I realized that it needed just a little something more. I found a few light purple sequins, and attached them to the velum strip. That was exactly what it needed. 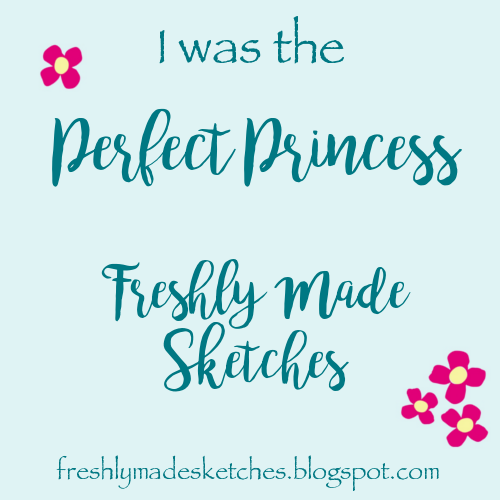 I just love the Freshly Made Sketch Challenge blog. Their sketches are so wonderful because they allow for a lot of creative freedom. They never fail me when I’m in a little bit of a creative slump. If you’ve lost your creative mojo, you should definitely check them out! They even have all of their sketches archived. I started with an A2 size piece of Bristol paper and white heat embossed it using the Hero Arts wave background stamp. This was my first time using this stamp. I always worry a bit when I’m using a detailed background stamp, but let me tell you, it stamped beautifully! I just love Hero Arts stamps and my Misti of course. Using Tim Holtz Distress Inks (Picked Raspberry, Carved Pumpkin, Cracked Pistachio, Mermaid Lagoon and Wilted Violet), I ink blended the whole piece in a rainbow like design. I die cut a frame from the Lil’ Inker Designs Dual Dotted Rectangles die set, and glued it on the left side of my card front. I cut away the part of the frame that wasn’t attached to the card front, and using the same Distress Inks, I ink blended the frame to match the base. I love how the frame got a little bit of the deeper colors. I think this prevented it from disappearing into the background a little. Now for the sentiment…I’ve been wanting to try the Hello die from Mama Elephant for a while. I gold heat embossed it twice to give it a little dimension and adhered it in the bottom left corner of the frame. I cut off the front portion of the die cut that didn’t fit on the card. For a few final touches, I glued a some sequins just above the greeting. I trimmed the card front just a smidge (is that a word?) because I wanted the Neenah Solar White 110# card base to frame this colorful piece. This sketch is perfect for so many beautiful floral stamps out there. Because I just received my first Unity Stamp Company order, I was excited to use one of them. I chose their Steps of Courage set for my floral image. I started with a 4.25 x 5.5 inch piece of Bristol paper. I white heat embossed my floral image on the bottom right corner. I knew that I wanted a soft look, so I pulled out my Zig Clean Color markers and used a water brush to apply the color. After coloring the flowers, leaves and stems, I applied a very light wash of light blue around the image. I drew a rough square around the card making sure to leave a space where the flowers met the bottom. It took me a while to decide on where to place my greeting. I knew the sketch had the sentiment closer to the bottom, but I felt it detracted from the pretty flowers. I decided to place it higher on the card. I white heat embossed a greeting from Technique Tuesday’s Beautiful Bouquet stamp set on to black card stock. I felt it was a little plain, so I added a slight lavender mat around the fishtail greeting. I then adhered it with fun foam to add dimension. For some final touches, I glued a few sequins (2 black and 1 iridescent) near the flowers. To soften the brightness of the card, I sprayed some black watercolor over the whole thing to get those small black flecks. I attached the card front to a top folding gray card base. Once again, I’ve gone to one of my absolute favorite card sketch sites to get some inspiration. Freshly Made Sketches is a great card challenge site that you must really check out! When I first saw this week’s sketch, I immediately thought of washi tape. I don’t know where that came from because I don’t think that I’ve ever used washi tape on any craft item. My small stash tends to be used to hold card pieces down when I’m die cutting. I went with my idea, and I’m pretty happy with the results. I chose 3 of my favorite washi tape designs that coordinated pretty well together. I simply ripped a piece (no measuring or cutting with scissors here) of each and placed them on a piece of white card stock. I then matted that piece with some blue card stock and then adhered that to my A2 top folding card base. Using one of my favorite heart stamps, Hero Arts Patterned Heart, I heat embossed it with Recollections gold embossing powder. The heart is attached with dimensional adhesive. All that was left was the greeting. I decided on one of the greetings from Simon Says Stamp’s Hydrangea Blooms stamp set. I haven’t made anything for several days, and I can always tell when it’s time to create. So, I pulled out some newly purchased stamps from Lil’ Inker Designs (I just love their stuff), and went to work. Of course, I started with my favorite card size, A2 4.25″ x 5.5″, made from Neenah Solar White 110# card stock. I then cut another 4.25″ x 5.5″ piece of white card stock for my ink blending and embossing layer. First, I white heat embossed the floral images from Lil’ Inker’s Inky Flowers stamp set. I knew that I wanted the flowers to be on a good portion of the card, so I had to do this in multiple steps because of the size of the images. Then, I set to work on my ink blending. I used both Blueprint Sketch and Wilted Violet Distress Inks. After I was done ink blending, I gently rubbed a baby wipe across the floral images to remove any ink that may have landed on the white embossed areas. To finish the base layer, I sprayed a light water mist over the top. (I just love to watch Distress Inks react with water.) For one last detail, I spritzed my Tsukineko Shimmer Spritz over the enter surface to give it a little sparkle. In order to do something a little different than just adhering this whole piece on the card base, I decided to cut it up in a few pieces. After I cut them, I felt that they needed a little something to help define the edges a bit, so I used my ink blending tool and gave the edges another layer of ink. I arranged the pieces so that there was a slight gap between them when I adhered them with dimensional adhesive. That left just the greeting. I thought that a silver embossed greeting would blend perfectly with the Distress Ink colors that I chose. I cut a thank you greeting from Heidi Swapp’s thank you die and cut it in half so that I had a two word greeting. I silver heat embossed it with Zing Silver Metallic embossing powder. I just love how embossing a die cut gives it so much dimension. To finish it off, I glued the greeting on the top with some liquid glue. 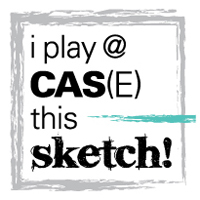 Another one of my favorite card sketch challenge sites is CAS(E) this Sketch. Their sketches always challenge me to try and think outside the box (which is a pretty difficult thing for me). Using the Pierced Heart Stax dies from My Favorite Things, I cut the hearts out of the top kraft layer, the blue layer and the yellow layer, leaving the red layer alone. I adhered all of the layers so that the hearts lined up. After seeing it all put together, I thought it looked a little dull, so I added the black strips along the outside cut edge because I knew that my greeting was going to be black. I triple cut the love greeting from the Simon Says Stamp Love die set and glued them together to give a little dimension to the greeting. Even after that, it still looked a little plain, so I pulled out my newly acquired black Nuvo drops and added those above the heart and below the greeting. I also added the small kraft heart in the center from the Pierced Heart Stax smallest die.